Becca is the owner and creator of Mustard Made. Account Aspects started working with Becca to provide Xero training after a discussion from her Accountant Active Accounting Group. Being part of Becca’s journey has been rewarding. We have watched her grow from a market stall style business to an online Etsy store to now an international wholesaler and stockists. We sat down with Becca to ask her about her passion and where her idea for Mustard Made was born. We discuss the relationship between Account Aspects and Becca and how Xero has helped her business. Tell us a bit about yourself and how you started your business ‘Mustard Made’? I’m Becca, a mum of two originally from London but living in Newcastle for 7 years. 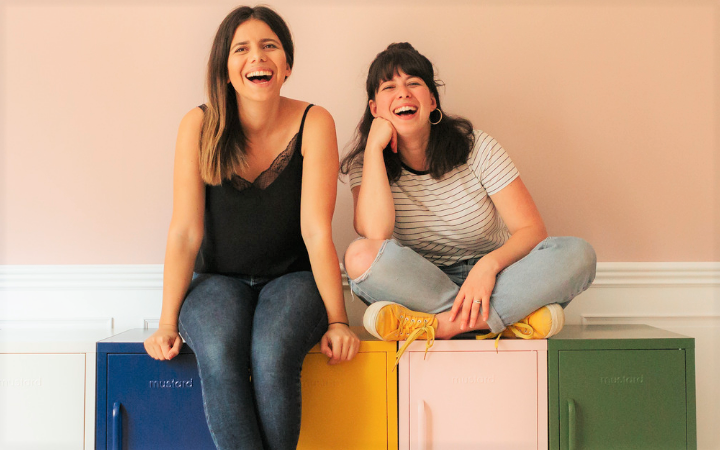 I launched Mustard in February 2018 with my sister Jess and we run the company from opposite sides of the world. We like to joke it is just an elaborate plan to make sure we get to hang out more often! Jess and I always wanted to start a business together but living on opposite sides of the planet we had to come up with something we both loved and could work anywhere. i looked at my studio and saw a random selection of metal lockers. One flaky old one from the side of the road, a few from antique stores and new lockers I had bought. I always had a locker thing. This sparked our passion, which started the research, brainstorming and dreaming. I think success for me is about creating something out of nothing, knowing that I had ideas that I brought to life and can now see and touch the results. There are days where it feels like I’m not getting anywhere or not moving fast enough but success is more about taking a step back, enjoying the journey and seeing how far you have come. You have been working with Account Aspects through your previous business and Mustard Made. Tell us how the relationship started and how Account Aspects has helped you in your business. I am a creative person and love designing. Seeing people enjoy my creations once they have bought them brings me great joy. This is the side of the business that I wanted to do more of and money was never the focus. To be really honest, money has always been pretty low on my priority list! Probably because of this, it was always crazily stressful when my Accountant, Active Accounting Group wanted my information to complete my end of year tax. Putting time and effort into this was always something I avoided. My accountant suggested I meet with Account Aspects for some Xero training to learn how Xero can help me get the insights and the answers I needed to know when running a business. Working with Account Aspects has really helped me gain control and see it as not only an achievable process but a really rewarding part of my business. Account Aspects has conducted personalised Xero training with you, how has this helped you navigate the software and understand your business figures? I really learn best in person so working with the team at Account Aspects to go through my Xero account was the most effective way of me learning. Showing me how it works gave me the confidence to tackle tasks I usually hid from. I did a series of One on One Xero training sessions that gave me the basic skills and then we built on this knowledge to top up when needed as things evolved. I now feel so much better equipped to run Mustard Made and for the stages of growth we envision in the future. You are a capable business woman and with the training you received you have many skills. Explain to us how having Account Aspects regularly on hand to help you with your bookkeeping help you achieve more? Ultimately I now feel I can handle my Xero day to day basis. My business is a little more complex now with the introduction of multi-currencies, inventory and pre-orders. This is a new learning curve for me and one I don’t always have the time for. Having a team of bookkeepers on hand really is the difference between being on top of my accounts and those last minute panics when a BAS is due. Being able to call on Account Aspects to help me with my bookkeeping when I have a problem or question means I can move forward with confidence and focus on the things I enjoy more. It has taken the stress out of bookkeeping for me. Before working with both Xero and Account Aspects, what was your perception of bookkeeping? In my first business I often felt overwhelmed with the financial side of the business. Being an entrepreneur, it totally sucked the fun out of it for me. It just seemed like another language. I knew that to be a serious business it was important, but something I could do later. Being shown how the accounts process comes together and having up to date information in Xero at my finger tips, I know the importance. With the right training I’ve been able to see it as something dynamic, useful and manageable. You use Xero and other software solutions to manage your business. What software do you use and how do they assist you to run Mustard Made? Our business has just two staff (Jess and me!) which means we have to be efficient with our time. We use Shopify to run our online store, Smart Send for shipping and Trade Gecko for inventory management. These software tools are integrated so there is less double handling and room for error. This gives us more efficiencies in the business. Mailchimp is also used for automated bulk emails and Later to schedule social media posts. All these things help us to focus on the bits that only a human can do! Would you recommend Xero to other businesses and why? Absolutely, I couldn’t run Mustard without it! Xero is a vastly complicated system, but manages to make it seem simple and intuitive. I am a visual person I have even found Xero a little bit fun! We would love to know what it is about your products that makes you so passionate. Tell us more about your products and where you can buy this from? Would you recommend Account Aspects to other businesses and why? I would happily recommend Account Aspects to small businesses who want to free up their time and skills to focus on what they do best, knowing their finances are in capable hands. We would love to work with more business owners like Becca. if you can relate to her story and would love some help, contact us today. Watch Becca in action as she builds her Mustard Made Shorty locker!